These are the transition metals, according to the IUPAC definition. 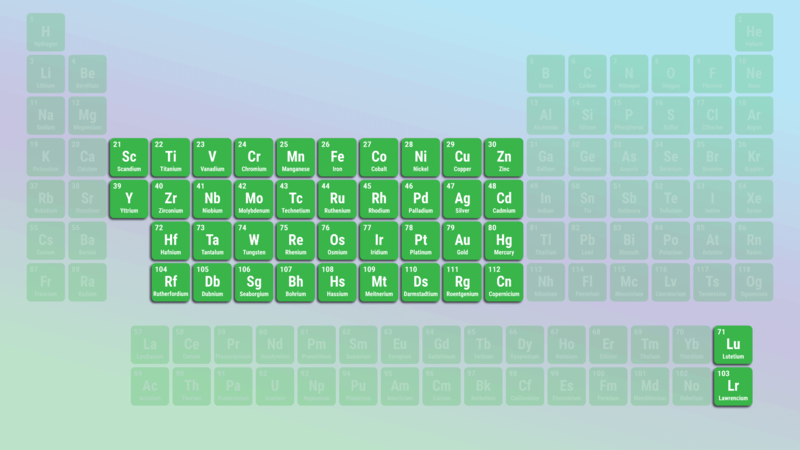 The transition metals are the largest group of elements on the periodic table. They got their name because English chemist Charles Bury described a transition series of elements in 1921. Bury examined the transition from an inner electron layer with 8 electrons to a layer with 18 electrons and from a layer of 18 electrons to one with 32. Today, most people think of these elements as transitioning from one side of the periodic table to the other. Moving from left to right across the periodic table, an electron is added to the d orbital of each atom, transitioning from group 2 to group 13. Here’s a look at the different ways of defining the transition metals, a list of which elements are included, and a summary of their common properties. The most common definition of a transition metal is the one accepted by the IUPAC. A transition metal is an element with a partially-filled d subshell or the capacity to produce cations with an incomplete d subshell. Technically, the elements zinc, cadmium, and mercury (group 12) should be considered post-transition rather than transition metals because they have a full d10 configuration and normally produce ions that retain this configuration. Experimental evidence of mercury behaving as a transition metal was obtained in 2007. Copernicium should probably be excluded on the same basis, although its oxidation properties have not been verified experimentally. However, most people include these elements in the transition metal list. Some people exclude lutetium and lawrencium from the list. But, lutetium and lawrencium are technically group 3 elements that fit in the “space” in the periodic table. There are also scientists and educators who include the full lanthanide and actinide series as transition metals. They often form colored compounds. The colors are due to d-d electronic transitions. They display multiple positive oxidation states. This is because of the low energy gap between states. They are silver metals at room temperature. The exceptions are copper and gold. They are solids at room temperature. The exception is mercury. They are paramagnetic (attracted to a magnetic field). Generally, paramagnetism results from unpaired d-electrons. Three important elements regarding magnetism are iron, cobalt, and nickel. All three elements produce a magnetic field. They have low ionization energies. The metals have high melting and boiling points (except mercury). They are good electrical and thermal conductors. IUPAC (1997). Compendium of Chemical Terminology, 2nd ed. (the “Gold Book”).